Posted on September 4, 2015 at 8:46 pm. 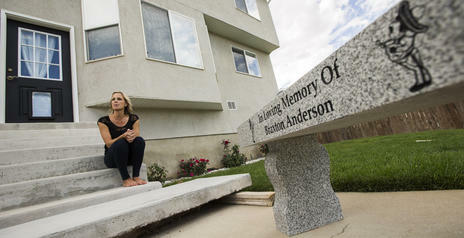 SALT LAKE CITY — Bobbi Anderson remembers clearly trudging through a snow-covered field one February morning and coming upon the lifeless body of her son, Braxton, lying shirtless in a pool of mud. Not far away, life was fading from Braxton’s friend, who had also shed his clothes and collapsed in a patch of frozen grass, bewildered from intoxication and hot with the onset of hypothermia. It was an unthinkable end to a frantic search that began at a friend’s house and lasted all night. The evening before, Anderson had dropped off her 16-year-old son at a friend’s house with plans to pick him up later. It was nothing unusual. Braxton loved being with friends, and his mother trusted him. He was a straight-A student on track to graduate early. But when he didn’t respond to his mother’s repeated calls and texts, she knew something was awry. She began carefully tracking his whereabouts, driving from house to house, asking friends and parents if they’d seen her son. Eventually, Braxton’s phone stopped taking calls, and the search intensified. About 8 a.m. the next morning, Anderson reached one of Braxton’s friends, who said he had lost his wallet while walking through a field with Braxton that night. By the time they found Braxton’s black and blue body, he’d been dead for several hours. His friend was taken to a hospital, where he spent the next several weeks recovering from alcohol poisoning. While in the hospital, the friend admitted he and Braxton had been drinking vodka and energy drinks purchased by his sister. Both teens had a blood-alcohol content of 0.27.